I’m in one of those phases where I’m not finishing a lot, and I’ve been working all the time so there hasn’t been much blog activity. But today we have a couple things! I was teaching a sock class for knitting two socks at a time, and the basic pattern specifies worsted weight – it’s very useful for getting through 2 heels in one class. I almost finished the socks in the last class a week ago, but then they sat around on my couch waiting to be grafted, which is so unlike me! 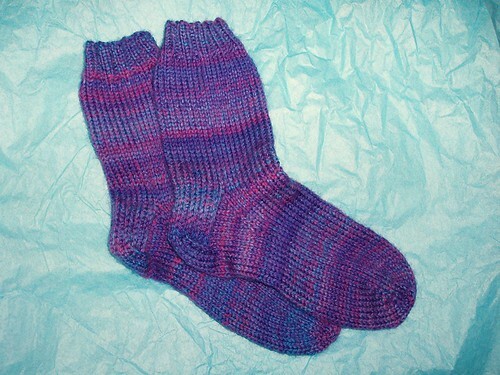 Usually once I hit the toe decreases nothing will prevent me from finishing a pair of socks. I bought the yarn in Boston shortly before it was discontinued, but I have so little worsted weight sock yarn in my stash this was the only convenient one to grab. I’m glad I did! I thought it would be a little more striped, but the finished socks are fairly subtle (and more pink/purple than blue, also a surprise.) 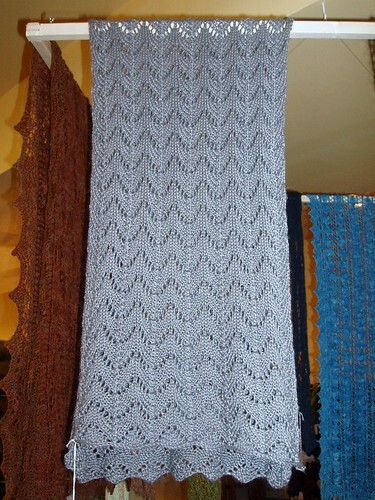 The yarn is quite soft and the color effect is achieved by using plies of different colors. It was very nice to knit with and I’m looking forward to seeing how it wears. 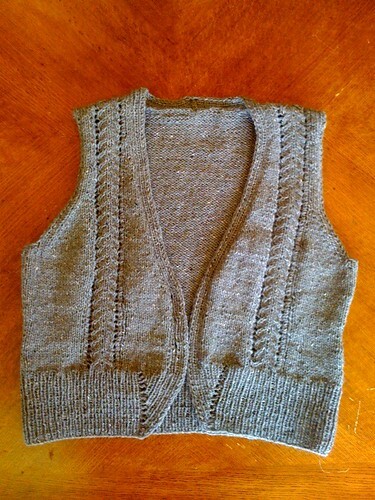 I’ve also been knitting a vest for the yarn store. I didn’t have my camera today, so I took this picture with my iPhone. I’m trying to get WIPs cleared of my Ravelry page ASAP since I’m getting kind of guilty about their growing numbers. 😉 This vest is, of course, not something I would normally knit, but I enjoyed working with the yarn. The pattern, on the other hand, was a bit annoying. It’s written in a way that was very difficult to follow – probably to save room as it is printed in a booklet. Suffice it to say that it was not an ideal project for putting down to jump up and help customers. And that 7 stitch ribbed band around the front / neck? Knit as a strip and sewn on. Yeah. But hey, it turned out great! Well, the secret knitting continues – at this moment I have no less than *four* secret projects on the needles. No kidding! And most of them are time-sensitive, so they’ve really been getting all my attention lately. That said, I can share this old project. It actually was not secret at all, but it was for work and needed blocking and so it was not photographed as a finished item until just the other day. As you can see, my sharf (I have decided it is a sharf instead of a scarf, because it is very wide and a bit shawl-like. Yes, I do realize it is called a stole!) is in good company with the other lacy knits hanging out at the store. Although it is something I probably wouldn’t knit myself, it was pretty fun. The lace pattern is very easy to memorize and became a bit boring after a little while. I will admit that I did not block it. My apartment – based on size and cat to closeable door ratio – is not a good place for blocking lace. One of my lovely coworkers was nice enough to block it at her house. If I were going to knit this pattern again I would take out a couple of repeats width-wise because, as mentioned above, the scarf turned out very wide and not as long as I would have liked. Of course the yarn used in the book has some insane amount of yardage, but I still think the scarf is way wider than necessary. 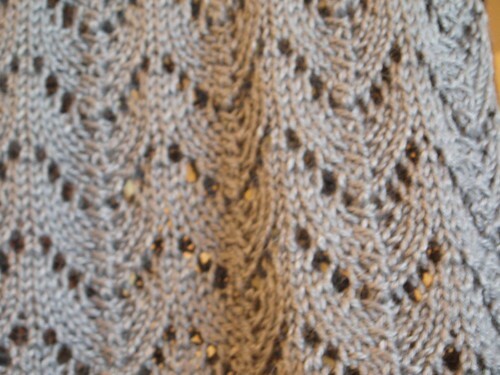 Apparently a lot of people agree because it looks like most folks on Ravelry also took out lace repeats. Also the 2 stitch garter border doesn’t really do anything except fold to the back. If you want a border, make it bigger!